Segerstrom Center’s Movie Mondays return for the ninth year. Movie fans can enjoy these annual FREE alfresco Movie Mondays on the Center’s Arts Plaza. Arrive early to stake your place on the plaza and enjoy early dinners, music and people watching. Since the movies are projected on the side of Segerstrom Hall, everyone has a great seat. Set-up begins at 5:30 p.m., with the movie starting at dusk (approximately 8 p.m.). Guests are encouraged to bring beach chairs or other easily portable seating items, snacks and picnic suppers. 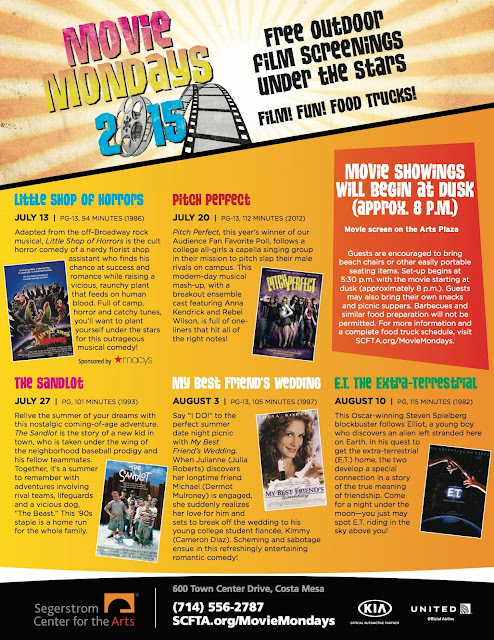 Each Monday will also feature different food trucks serving throughout each screening. Barbecues and similar food preparation are not permitted. Prior to the show (starting around 7:30 p.m.) there are audience participation events. For more information, please call (714) 556-2787 or visit www.scfta.org/moviemondays.